Author Craig Vetters’ newly released “The Gospel According to Shaggy” is a story of the subtle things that change people’s lives. 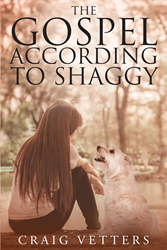 “The Gospel According to Shaggy” from Christian Faith Publishing author Craig Vetters is the story of a man and the dog and the relationship that would change both of their lives. “The Gospel According to Shaggy” is the creation of published author, Craig Vetters, founded L T C Ministries in 2011. This ministry provides church services for residents of assisted living centers as well as memory care units. The ministry now consists of seven team members providing five services each week. Published by Christian Faith Publishing, Craig Vetters’ new book takes readers through the relationship between the author and Shaggy, Craig’s dog. Through Shaggy’s jovial nature the author began to see the world in a different, more positive light. A serendipitous encounter at the local humane society put Shaggy in the home of the author, and through the dog’s simplistic and loving nature the author began to see a better way to live life through Shaggy. View a synopsis of “The Gospel According to Shaggy” on YouTube. Consumers can purchase“The Gospel According to Shaggy” at traditional brick & mortar bookstores, or online at Amazon.com, Apple iTunes store, Kobo or Barnes and Noble. For additional information or inquiries about “The Gospel According to Shaggy”, contact the Christian Faith Publishing media department at 866-554-0919.